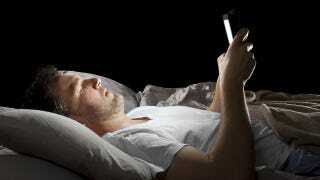 A new Harvard study is re-affirming the assertion that reading light-emitting e-books before bed, like computer tablets, could have a detrimental effect on sleep, which can in turn lead to serious health problems. You may already be familiar with the suggestions that too much exposure to light, both before and after we go to bed, can be disruptive to our sleep patterns. The problem is that, as diurnal creatures, our bodies respond poorly to suppressed releases of the brain chemical melatonin, which is emitted when we're exposed to darkness. And when we're deprived of sleep, we become prone to some rather serious conditions, including an increased risk of breast cancer, colorectal cancer, and prostate cancer. At the same time, the subsequent triggering of cortisol introduces another set of problems related to body-fat levels, insulin resistance, and systematic inflammation. During the two-week inpatient study, twelve participants read digital books on an iPad for four hours before bedtime each night for five consecutive nights. This was repeated with printed books. The order was randomized with some reading on the iPad first and others reading the printed book first. Participants reading on the iPad took longer to fall asleep, were less sleepy in the evening and spent less time in REM sleep. They had reduced secretion of melatonin, a hormone that normally rises in the evening and plays a role in inducing sleepiness. Additionally, iPad readers had a delayed circadian rhythm, indicated by melatonin levels, of more than an hour. Participants who read on the iPad were less sleepy before bedtime but were sleepier and less alert the following morning after eight hours of sleep. Although iPads were used in this study, researchers also measured other devices that emit blue light, including eReaders, laptops, cell phones and LED monitors. In summary, participants who used eReaders — and by eReaders they mean iPads set to maximum brightness (more on this in the next section) — were less drowsy in the evening, took longer to fall asleep, and experienced reduced morning wakefulness compared to how they felt after reading a printed book. The onset of sleep was delayed by around 10 minutes, and the onset of REM sleep by about 11 minutes. As noted in the study, "A diagonal measurement was used for the screen size dimension. Light readings were taken while devices were at their maximum brightness setting, and all measurements were recorded from the same distance (38-40 cm) from the screen and in the same background conditions...Neither the book nor the Kindle eReader emitted light; the irradiance measured was the ambient room light emitted by the ceiling fixtures and reflected by the printed book or the Kindle screen." So, even though the Kindle doesn't emit light, it still exhibits an irradiance above that of a regular book. But it's still a very minuscule amount of light; it still compares far better to a book than it does a LE-eBook. The Apple iPad and tablets that are cited by the Harvard team use a backlit display that shines upwards into your eyes at around 60 Hz. e-Paper based readers on the other hand use technology provided by e-Ink, which mimics real paper. The average e-reader does not have a built in lighting system, but the ones that do normally have five small LED lights built into the bottom of the bezel and project light evenly across the screen. This provides a subtle illumination effect, but does not increase pupil dilatation, like a tablet does. Which is a good point. During the five-day study (the duration of which is a shortcoming unto itself), participants only used iPads. The researchers say they considered other devices, but they didn't actually test those devices on their volunteers. What's more, during the four-hour exposure period, each iPad was set to its maximum brightness setting. It's conceivable that a reduction in brightness could have a measurable influence on the rate and amount at which melatonin is held back. Conversely, however, the four-hours of exposure to LE eReaders prior to sleep is not indicative of reality these days. Most of us experience far more than that — typically around 7-8 hours. In future, I'd like to see the study repeated, but with real world conditions, an assortment of devices (the effects of each measured individually), and at varying rates of illumination. Also, melatonin rates should be measured after the end of each night rather than at the end of the 5-day session. The results of this study are of particular concern, given recent evidence linking chronic suppression of melatonin secretion by nocturnal light exposure with the increased risk of [specific cancers] associated with night-shift work...which has now been classified as a probable carcinogen by the World Health Organization. Moreover, the observation that the endogenous circadian melatonin phase was 1.5 [hours] later when reading an LE-eBook compared with reading from a printed book suggests that using a light-emitting device in the hours before bedtime is likely to increase the risk of delayed sleep-phase disorder and sleep onset insomnia, especially among individuals living in society who self-select their bedtimes and wake times. Induction of such misalignment of circadian phase is likely to lead to chronic sleep deficiency. My advice, try to read a book or a kindle before bed instead of a conventional LE eReader. And if you have to read a light-emitting device, turn the brightness down as much as possible, or don't read it in the hour or two preceding bedtime. Read the entire study at PNAS.